Jenkins Johnson Gallery is pleased to present its first solo exhibition by interdisciplinary artist Deborah Roberts. The show will feature multi-media collages that explore issues faced by black girls and women. The opening reception for the artist will be held on Thursday, February 1, from 5:30 pm to 7:30 pm. The exhibition runs from February 1 through March 17, 2018. Deborah Roberts states, “Having one’s identity dismantled, marginalized and regulated to non-human status demands action. This led me to critically engage image-making in art history and pop-culture, and ultimately grapple with whatever power and authority these images have over the female figure.” By combining found and manipulated photographs with paintings and drawings, Roberts creates female portraits that challenge myths and stereotypes attached to young black girls. 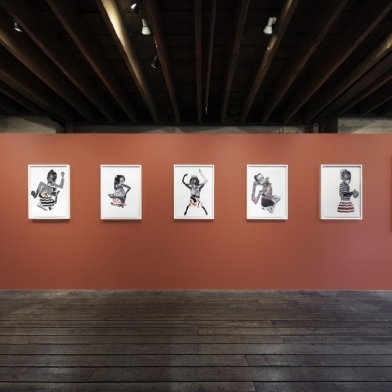 The multi-layered faces of Roberts’ figures exemplify the multiplicity and complexities of black identity, while subverting social ideas that seek to homogenize the black female body. Although they are constructed by photographs of famous individuals, such as Michelle Obama, Willow Smith, and Gloria Steinem, the images are cut and altered beyond recognition to create a portrait that adheres to a more universal beauty standard—one inclusive of women of color. The subjects of Roberts’ collages are located in the space where social expectations and stereotypes encroach upon the naiveté and innocence of childhood. With an eight to ten-year-old young black girl as the protagonist of her work, Roberts confronts the ubiquitous influences of popular culture and visual culture on the minds and bodies of young black girls. By reassembling and altering found photographs, Roberts reclaims power over the images that have impacted black women’s self-image since adolescence. 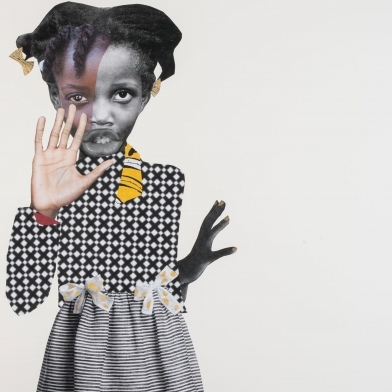 Deborah Roberts was featured in “Fictions” at The Studio Museum in Harlem, which has just closed. She will have an upcoming solo show at the Spelman College Museum of Fine Art, Deborah Roberts: The Evolution of Mimi, which runs concurrently with our exhibition, January 23 to May 19, 2018. She has a group exhibition at MASS MOCA in 2019. Roberts’ work is in the collections of The Studio Museum in Harlem, NY; Block Museum of Art, IL; Blanton Museum of Art, TX; Montclair Art Museum, NJ; and The Tang Museum, NY. Roberts earned her MFA as a Syracuse University Research Fellow at Syracuse University, and was a recipient of the Pollock-Krasner Grant in 2016. In the past few years, the art world has begun to more graciously reward artists who have honed their practice over previous decades, while remaining inexplicably under-the-radar. Artists like these 10 members of The Artsy Vanguard—a new, annual list of the 50 most influential talents shaping the future of contemporary art practice—are finally getting their due, with museum retrospectives, representation by major international galleries, and surging collector interest. The second edition of Untitled, San Franciscowrapped up at the Palace of Fine Arts on January 14 after four days that kicked off with an exclusive VIP opening on January 11. Untitled, San Francisco’s sophomore effort proved to be more popular than the first, bringing in 51 exhibitors from 11 countries. “In a way moving to a new venue in your second year is like starting over again,” said Manuela Mozo, the director of Untitled, San Francisco.